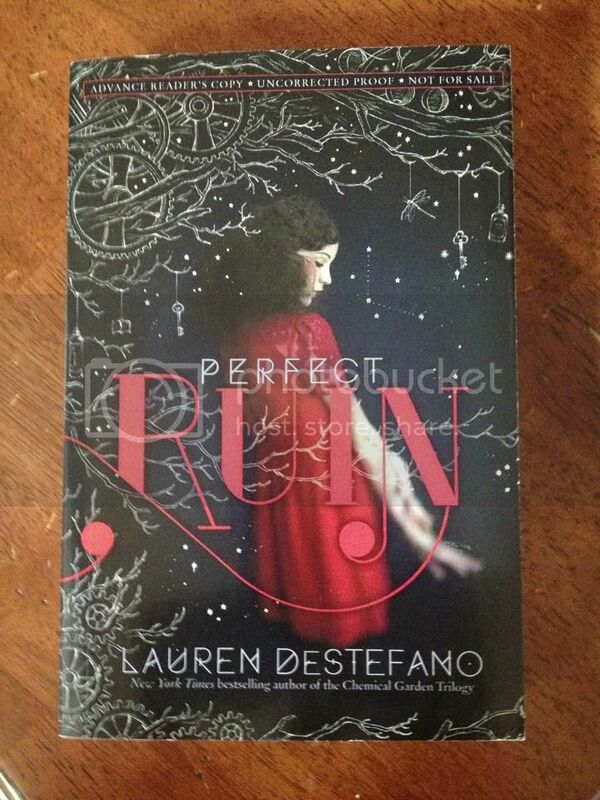 I am really excited to show you my review for Perfect Ruin (The Internment Chronicles #1) by Lauren Destefano! I want to give a huge thank you to Simon and Schuster, who sent me an ARC of this book when I requested it. I am eternally grateful for having this opportunity as this is a book I have been really looking forward to reading. Receiving this book for free has in now way influenced my opinion or review. I am a huge fan of Lauren DeStefano's The Chemical Garden series. While I wasn't so sure of the premise when I read it, the writing was unbelievable and just pulled me along through the story so effortlessly. So, when I found out that Lauren was starting a new series I was very excited to see what it was all about, especially once she started posting teasers for it.. As a matter of fact, I didn't even need to read the blurb of the book to know that it would be something I would want to pick up. And I was not wrong in any way! The cover of this book is just amazing. It's simple and beautiful. There's something about the red that really grabs your eye and just holds it there. I've studied it quite a number of times and the more I look at it the more I love it. Not for the fact that it necessarily gives hints to the story but because it is so eye catching in it's simplicity. When you first meet the characters and are introduced to their world, it's completely intriguing. Who would not want to find out about an island floating in the sky, broken away from what we now know as Earth? And despite the different society these characters live in, we still see they have some normalcy of teens, going about their normal days at school, dealing with normal teen problems (when will I kiss a boy? what will it be like?). But DeStefano quickly debunks that these teens are anything but normal. They are made of the society in which they live and forced to follow the laws and rules which that society's Kings have created to keep them safe. But, as with any government run society, there are people who question the motivations of those who make the rules, question the reality that has been set before them. DeStefano creates a world that is imaginative and dystopian in nature while still flitting on the edges of fantasy and a bit of science fiction. A perfect society that is suddenly thrown into chaos when a murder is committed for no known reason. Morgan and her family appear to be your typical family of Internment (the floating island in the sky). At first we see she is in school, engaged to her betrothed (as all teens become at a certain age). Her father works as a patrolman, he brother writes. But then things start to fall apart and her family is anything but perfect. Her brother, a recovering jumper, is blind and can't function in society, his wife spends her days making sure he's safe. Her mother suffers from terrible headaches that all but disable her for much of the time. Her father seems to dedicate himself so much to his job he's never home. And Morgan herself, has started to wonder if there's something wrong with her. The edge of Internment, a place which is forbidden, seems to be calling to her, but she can't understand why. And, since he brother's injury is directly related to having jumped at the edge of the floating island, she wonders if she's not going crazy herself with her thoughts of what else is out there. Morgan makes a lot of growth in this story. She goes from someone willing to accept how her society is, to questioning things she never thought she would. Morgan's best friend, Pen, is a bit on the wild side, and the opposite of Morgan's shy demeanor. While she doesn't directly disobey the rules of their society, you can see she's teetering on the edge. She takes things just that bit too far, with how she dresses, with how she shuns her betrothed a bit, even with how she acts. And Morgan's betrothed, Basil, is not what I expected at all. He seems prim and proper, wanting to do right by Morgan whatever may come. So, when things go haywire, I expect him to conform only to society's rules and laws. Yet, he seems to have an underlying want to turn against what he's known. Lex, Morgan's brother, is very much the outcast you often find in stories such as this. He stays holed up in his home, writing stories, but never doing anything with them. He was at one time a productive part of society, before he decided to jump and lost his sight. I really want to find out more about him. While he lends a hint of what will happen to those who disobey to the story, I fell like there is something else we need to learn from him, something else his background will show us. I'm still confused as to why he jumped and I need to know more! Judas, well, I thought for sure he would play different role in Morgan's life when I first met him, but he didn't, which I was actually grateful for. He's a bit of a mystery, which I am sure is intentional, and I'm sure we're going to find out more of his story in the future. Finally, while we never actually meet Daphne, we get to know her a bit through her quotes at the head of each chapter. All the characters in this book are fairly well developed and executed. I would like to know more about them for sure as I think there are some secrets we still have yet to learn; secrets that will help us understand Internment and it's society. I love that the romance is not the complete focus for this book. The romance is well established right from the very beginning. It's there, and the tension that comes along with it just flits along the outskirts of the story, but you are not wrapped up in it and consumed by it. The overall story plot revolves around the murder of Daphne Leander and how it puts Internment into turmoil. Since there hasn't been a murder in many, many years, it is unthinkable to a large part of Internment's society how something such as this could have happened. It has people scared and completely thrown from the course of their lives. DeStefano has come up with such a unique premise with this world in the sky. How did it get there? How does it stay there? What secrets does it hold? When I first started reading, I thought for sure that Internment was another planet and the characters were perhaps what we would consider aliens. But it's not at all like they, they are human in every way, except they live on a piece of land that hovers in the clouds. Once again I was enthralled with Lauren's writing. It is lyrical and totally poetic. I didn't want to put the book down because her words had me wrapped up and taken away. She writes eloquently and with such ease. Her words are engaging and fascinating. The words not only flow off the page, but right into your head, encasing you in the plot and theme of the story and not letting you go. Even at the end, I was left wanting more, left wondering how the next book in this series will continue to bewitch me. But I have total confidence that DeStefano will do it for sure! She introduces the world to us in small bites, adding on to each step until we can "see" the complete picture of this society. However, as with any dystopian, this society is certainly now what it seems, and the rulers have their secrets, as well. And, of course it wouldn't be a trilogy without giving us some sort of cliff hanger at the end! While I often get annoyed with cliff hangers, this one just makes me want to jump right into the next book! I can't wait for it! I can't wait to find out what DeStefano has in store for her characters as she leads them through the unknown. Get it, read it, love it!